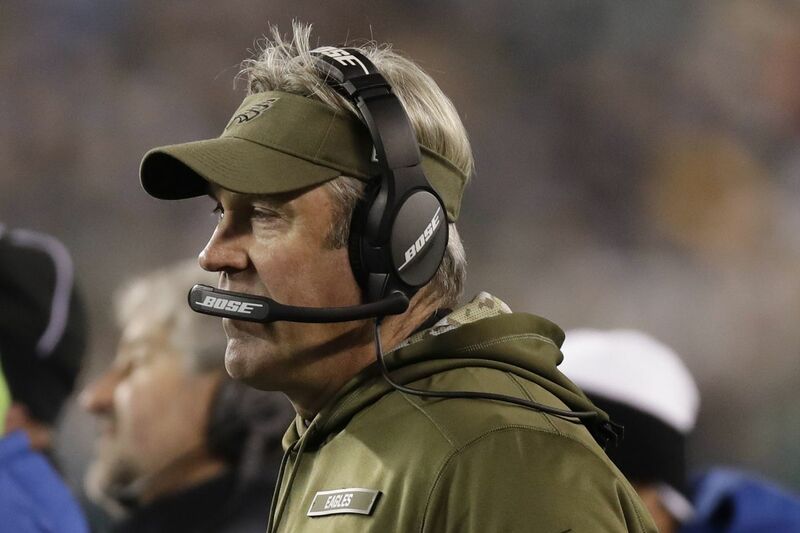 Doug Pederson turned in a disappointing head-coaching performance, to say the least. This was a bad one. The worst one since Doug Pederson first took the reins as head coach. That might be debatable, but it probably isn't. They had two weeks to prepare. They had an opponent that was on the ropes, with a coach taking friendly fire, and playoff hopes falling like the leaves. They had a home crowd that had a whole afternoon to imbibe. They had a 4-4 record and a brutal stretch of games on the horizon. This was the game that was supposed to show us that everything was going to be all right. Instead, the Eagles looked lost, disheveled, incomplete. A question that once seemed inconceivable now must be raised. Can the season be saved? "I know this one hurt," quarterback Carson Wentz said. "Sunday night football, divisional opponent, Cowboys at home, really the way we've played the last couple times at home, that's not what we pride ourselves on. This one hurt. We've got a lot of veterans in that locker room, a lot of leadership. Like coach said, we've all got to look in the mirror. What can we do differently? Where can we be better? We realize a lot of people are going to want to write us off at this point and now it's just time to play ball and try and go shock some people." There are a lot of reasons why this team looked as it did for as long as it did on Sunday night. Their Pro Bowl right tackle was inactive. Their lead running back wasn't even on the depth chart at the start of the season. Their newly acquired wide receiver spent much of the night on the sideline, one week of practice apparently not enough for Golden Tate to become a full participant in the playbook. On the defensive side of the ball, they were missing two of their top three cornerbacks, along with their starting safety. One common thread among many of the game's key moments was the word "backup." The Cowboys scored their first go-ahead touchdown of the fourth quarter when 33-year-old backup safety Corey Graham was unable to get out of first gear after a play-fake and spent the rest of the play 5 yards in Ezekiel Elliott's wake as the Cowboys running back hauled in a pass from Dak Prescott and strode into the end zone. Earlier, Elliott turned another backup safety into a piece of track-and-field equipment, hurdling over Tre Sullivan in the open field on a 32-yard run that helped set up a Cowboys field goal. On third-and-8 with just over five minutes remaining, Cowboys receiver Allen Hurns knocked backup cornerback Rasul Douglas onto his heels with an inside move and caught an easy slant pass from Prescott for a 23-yard first down on the Eagles' 9-yard line that set up Dallas' second go-ahead touchdown of the game's final frame. Ezekiel Elliott leaps over Tre Sullivan during the second quarter. The players will tell you that, in situations like the one the banged-up Eagles were facing, it is incumbent upon everybody who is actually upright to make plays. The Cowboys made them. The Eagles did not. Included in this group was the quarterback, who spent the first half looking as if his upper and lower halves were operating independently of each other. Wentz looked as uncomfortable in the pocket as he has since his rookie season, his throws high or low or otherwise off target, his feet looking like they were planted in sand. Maybe it was the mixture of personnel, or the lack of a consistent running game, or an interior Dallas pass rush that was often at his toes. His interception on the Eagles' opening possession was a simple matter of not seeing Cowboys middle linebacker Leighton Vander Esch lurking underneath his intended target. Yet it can't always be the quarterback who rescues them from the quagmire. Wentz had his moments. In the second quarter, he made back-to-back first-down throws to Zach Ertz, the first of them while disappearing beneath an avalanche of white jerseys. Late in the third quarter, with the Eagles trailing 13-6 and Dallas having just missed a field goal that would have made it a two-possession game, he roped an 18-yard throw to Jordan Matthews for a huge third-down conversion. Midway through the fourth quarter, he painted a perfect rainbow down the seam, Nelson Agholor on the other end, the ball dropping beautifully into his arms for a 51-yard gain that set up a 1-yard touchdown pass to Ertz that tied the game at 20-20. For a stretch in the fourth quarter, it looked like it was going to come down to what it usually comes down to. The Eagles had the better quarterback, and it wasn't particularly close. Instead, it came down to a defense that couldn't get off the field, a defense that couldn't make the plays that were there to make. There was a first-quarter interception that rattled into and out of linebacker Kamu Grugier-Hill's hands, the end zone 10 yards away, nobody in between. There was Ronald Darby bouncing off of Amari Cooper on an ill-fated third-down tackle attempt short of the sticks. "Are we doing enough? Are we giving enough?" Pederson said. "Each week, it's a strain — you have to strain yourself to make plays. That's just the way this game is, and we didn't do enough of that today." And, now, there is this: 4-5, enough of a hole that it is fair to wonder whether even an epically weak division can salvage a playoff berth. The Saints await, as do the Rams. Both of those teams handled their business on Sunday afternoon. The Eagles did not handle theirs. They are shorthanded. Their personnel is in flux. Their once well-tuned offense can't seem to find the same beat. The worry is real, now. This might be a good football team. But there's also plenty of reason to doubt.